Google Drive like any other cloud service allows you to store your documents which are synched automatically and are available on all your devices. You can store your documents, PDFs, photos etc. and you are given a free storage of 5GB to store your stuff. Besides Client for Windows and Mac, Google Drive is also available as app on your mobile devices like iPhone or android devices. You can download Google Drive app from respective app stores for iOS and Android. Recently we explained how to read iBooks on Mac, and today in iBook Series we are going to explain how to open and save Google Drive Documents in iBooks. Add some documents to Google Drive: If don’t have access to Google Drive and want to learn to setup Google Drive, please read this post on how to get access to Google Drive. Open the Document in Google Drive: Once you have downloaded and logged into Google Drive on your iOS device , you can easily open the documents to view them. For e.g. If you click on any image it will be opened inside Google Drive and incase of any PDF file it will opened too. Open Documents in iBooks : After opening the documents(e.g. PDF document) in Google Drive, you will see a icon similar to Forward button on the top right corner of the screen. 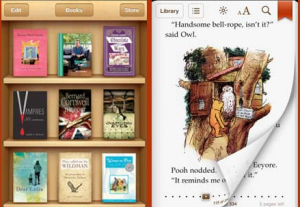 Touch that button and the Go to Open in and choose iBooks from the list of available options. If you don’t see iBooks in this list , most probably it is because the document that you are trying to open is not compatible for iBooks. PDF files can be easily opened in iBooks. Once document is opened in iBooks it gets stored there and can be read anytime even if your network connection goes down. Also Read How to Add Apps to Google Drive. Thank you for reading How to Open Google Drive Documents in iBooks from Survival Guide. Why not like us on Facebook and follow us on Twitter. We are also present on Pinterest where we share interesting stuff.